We send greetings from all of us at Tent of Nations. Thank you so much for your prayers, for the words of encouragement and your continuous support. It is a critical time we are in as Palestinians. Very soon, the timeframe for the negotiations comes to an end without any achievements; on the contrary, more facts on the ground are being created, new units and houses are built in existing settlements, land confiscation is going on and on – not to mention the wall, bypass roads that cut the Palestinian land into pieces, and settlers damaging trees on a daily basis. Recently, on the hill opposite to our farm, on land belonging to Palestinians from the village of Alkhader, settlers cut 450 grape trees. The situation on the farm is stable. 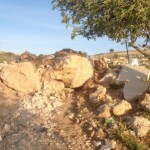 In mid-January, however, during the night, someone put in a locked gate across the road parallel to the large boulders that the Israelis placed there so many years ago. 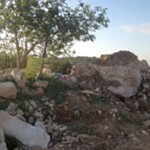 These are the boulders that block access for us to our farm. 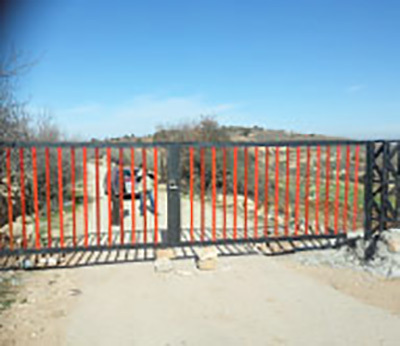 No one claimed responsibility for this gate, and when a couple of Israeli soldiers and a civilian came and asked why we put the gate there and said that they had just placed a demolition order on it, they were as surprised as we were that no one knew anything about it. A few days later, we found that someone had broken the lock. So, the gate to nowhere that served no purpose is now nonfunctional. In late March, we found three “stop cultivation” orders in the valley area, where ten years ago we planted apricot and apple trees. Now, we have altogether, since 1991, 42 “stop cultivation” orders. I sent the three new ones to our lawyer who is now preparing the papers to be submitted in April. We were very frustrated after receiving the three new “stop cultivation” orders, but in order to invest our frustration in a constructive way, we want to start very soon renovating two caves in the valley to use them for living, in order to keep a permanent presence in the valley. The women’s project is doing well. Women are coming on a regular basis from Monday to Thursday from 9.30 a.m. to 1:00 p.m. Jihan is very happy to see the outcome of her work. It is wonderful to see how encouraged those women are. The focus now is on helping women to gain more skills. Special thanks for supporting the wonderful work she is doing. Special thanks also for all volunteers who helped in the project. In the middle of hopelessness it is very difficult to keep hope alive, but we learned, and we are still learning, how to live this hope and to make it an active one, not a passive one. This is how we keep ourselves motivated and try to motivate others by living the experience. In November 2013, we started to prepare the ground for new trees. We cultivated new fields, rocks and stones came out of the ground, and we built terraces. A huge area of land was prepared for new trees. After the first rain, we were able, with the help of many volunteers, both internationals and locals, including Israeli friends, to plant hundreds of grape, olive, fig, almond and other fruit trees. We are trying year by year to increase the number of trees on the property. The goal is to have 25,000 trees back on the property. This number of trees was existing on the farm until 1936; in that year, 25,000 trees were destroyed. It was a miserable situation for my father and uncle who tried since then to plant new trees hoping to see again 25,000 trees on the land of their fathers. Both died before reaching this goal, but we inherited this responsibility; we promise to continue on the same path, hoping one day to see 25,000 trees growing on this 100-acre farm. Last year we received over $9,000 through FOTONNA alone for tree planting. Families (including many members of the Yeaney family) and individuals came and planted trees. So far this year, we already have an additional $6,000 sent from the profits of olive oil sales in 2013 from a coalition of Northern Virginia, DC and Maryland churches for trees. We are investing in more mature trees now, planting 3-4 year-old trees instead of saplings to save on water and to have a better guarantee that they reach maturity and are productive sooner than in the past. We received updated information from Daoud after he wrote the preceding piece for our Spring Newsletter and prior to printing it out and sending it off to all of you. The following news is current as of Tuesday, April 15. 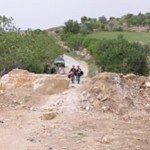 The two major blockades on the road leading to the village of Nahalin and the Nassar family farm were doubled in size on April 14, and a sign was posted reading “Prohibited from Entering: STATE LAND”. A local newspaper announced that the Israeli Civilian Authorities had designated 1,000 dunams (250 acres) as State Land (land south of the farm). Daoud’s neighboring farmers have 45 days to appeal the order. The land in question stops short of the family farm; the Nassars had already received such an order in 1991 and have been in court fighting the claim ever since. At the moment, visitors and volunteers can still enter the road to the farm, but they will have to walk from their buses near the Hebron road in order to get there. At least two tours have been canceled, however, because of the limited space now available for buses to turn around at the junction. 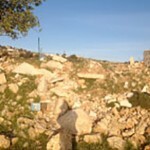 When walking, visitors will also need to negotiate around much more rubble in order to get to the TON site (see photos). …Israel has started the second phase of the Greater Jerusalem project, which aims to expand the borders of occupied Jerusalem to encompass 10 per cent of the total area of the occupied West Bank, a Palestinian expert in Jewish settlements said. Director of the Map Department in the Arabic Association for Studies based in Jerusalem, Khalil Tafakji, said that the decision of the Israeli Defence Minister Moshe Ya’alon, which was announced yesterday, to annex hundreds of dunams and add them to the land of three settlements in Gush Etzion is part of the project. The Gush Etzion settlement bloc is a cluster of Israeli settlements adjacent to occupied Jerusalem and Bethlehem in the West Bank. “This is a dangerous development in the project,” Tafakji said. Speaking to Arabi 21, Tafakji explained that the project makes great demographic changes in favour of Jews as the Palestinian population decreases to only 13 per cent in the city…. You can find more information by googling the following: Middle East Monitor – April 2014 – Gush Etzion. You can easily walk around this blockade. Now see what they have done! FOTONNA and Daoud are not ready to declare an emergency just yet, however. Even though the farm is not currently threatened, it is certainly negatively affected, even if only indirectly, by this action. The bigger picture is how it is going to have a devastating impact on yet another large segment of Palestinian society. We will keep you updated as to the legal actions taken by those most directly affected. Daoud has used the courts to his advantage; hopefully, these others can, also. If we need to activate our Emergency Response Plan (ERP) (see next article), we will certainly be in touch and hope you will respond swiftly and from the heart if and when we do. The update is short. The Israeli Military Court has not replied to the Building Permit requests or the request to re-register the land in the Nassar Family name that the lawyers filed in February 2013. Silence! The three new ‘”stop cultivation” orders did appear, however, as mentioned by Daoud, out of nowhere. His lawyer will keep us informed of just exactly what those mean. In order to be prepared for anything, Nadia Itraish, one of our Steering Committee members, initiated an Emergency Response Plan (ERP) that we can activate quickly if and when it looks like it is needed (i.e., the bulldozers show up and start to tear down those pesky high-security-risk tents). It includes the names and contact information of individuals whom we believe may be the movers and shakers (media, journalists, authors, politicians, religious leaders, State Department contacts, etc.) that should help us prevent any demolitions from taking place by applying pressure on the Israeli courts. These names are in addition to the thousands of individuals around the globe we would hope to have sign and circulate our petition. If you think you have a direct contact in one of those categories, please let us know; we will add their names and email contact information to our database. We also hope to never need to activate the ERP. We are prepared just in case, however, and hope that all of you who would be receiving the petition would sign it and send it on and make a lot of noise with your local congressmen and women. We will keep you posted! Now, on to more mundane things! We need to keep on as though we weren’t a little more than anxious about these events! As always, we extend our gratitude and thanks to all of the individuals who helped organize and pull together this tour under Bill Plitt’s guidance. (For those of you who do not know, this planning takes at least four months in order to pull off a glitch-free tour; this is no simple task.) Your Honorariums, generosity in sharing travel expenses, provision of lodging and meals for the weary travelers, and the outpouring of individual and organizational donations is all very impressive! Thank you – thank you. In 2013, thanks to all of you, we were again able to meet all of Daoud’s humble requests for financial support. We are also pleased to announce that we had enough to pay both Daoud and Jihan Nassar small Consultant Fees for all of their hard work in making their call for peace with justice through non-violence come to fruition. Their lives are a true reflection of their words and faith in action; your support for them is a show of your own faith in action. The entire Nassar family is very appreciative, as are all of us at FOTONNA. We are pleased to announce that Beth Moore has joined the Steering Committee and is serving as Director of Tour Planning. She has a B.A. in English and M.A. degrees in Teaching and in Business Administration. Beth’s experiences have encompassed teaching in public schools, running a day care center, serving as a general manager in a worker-owned cooperative, working in health education in a village in India and, most recently, completing twenty years as Assistant Director and then Director of the Office of Global Education at Viterbo University in La Crosse, WI. Over the years, she coordinated multiple educational tours for the students to countries around the world; she is very familiar with what it takes to put a good tour together. While having been conversant with the issues surrounding Middle East conflicts, and having had the opportunity to travel extensively, Beth’s first visit to Palestine occurred in November 2013 at which time she participated in the 25th Anniversary Conference of SABEEL and visited the Tent of Nations. She met with the women at the Education Center in Nahalin and was impressed by what she saw that Jihan has done there. Beth, herself, is impressive,and we welcome her to our family of friends. If she calls and asks if you would like to have Daoud make a presentation, just say ’yes’ and go from there. Here is the schedule for Daoud’s Spring 2014 Tour. If you live anywhere near one of these venues, we invite you to attend and bring a friend or two. As you can see, we are using a new tour tactic this spring that is focusing on a limited section of the country with fewer events and far fewer travel miles and time away from home for Daoud. As a heads up, we will be focusing on the Twin Cities and Southern Minnesota, Northeast Iowa and Western Wisconsin areas in the fall of 2014 – Oct. 24-Nov. 9. Interested in helping Beth coordinate this tour? Please contact her at: ebmoore1@live.com. We were alerted to an article (Is Peace Possible?) in the March/April 2014 online issue of Relevant Magazine. The article correlates to a YouTube video interview with each of the subjects in the article. One is an interview with Daoud, one is an interview with Todd Deatherage, and one is an interview with Roni Keidar. You know Daoud; Todd Deatherage is a member of FOTONNA’s Advisory Council and co-founder of the Telos Group; Roni Keidar lives in Netiv HaAsara, a town near the border with Gaza, and she is searching for a peaceful solution to the current conflict. If you simply Google Relevant Magazine and then add each of these names individually (i.e., Relevant Magazine – Daoud Nassar), you will find a link to the article and to the individual YouTube interviews. FOTONNA is mostly supportive of what is written, though there is quite a bit of room for discussion of some political/historical points, and some of the facts in the article about Tent of Nations are not quite accurate. Overall, however, the message is compelling, and the YouTube interview with Daoud is a good one if you need a refresher course on his story. All three stories taken together make a strong case for the need for a solution to the ongoing crisis now – not tomorrow, not next month, certainly not next year – but now. will be used for cooking. Solar Energy System: Extension of the already‐ existing solar energy panels has taken place; this means that more batteries and an inverter are needed to be purchased and installed. Grey Water Filtration System: We need to add a new pump as well as a system to purify the bacteria in the sewage water that will then be used for irrigation of trees and other plants. Filtration System for Rain Water: Newly‐dug cisterns need a filtration system, a water tank and two electrical pumps so that rain water collected in the cisterns can be safely used for drinking. This is for a new campsite being completed for more volunteers. These projects will need additional funds to help pay for the manpower and expertise needed to implement them. You can support the completion of these projects, as well as the Summer Youth Camps and the Women’s Education Center, through your donations to FOTONNA. Make checks out to: FOTONNA. Mail to: FOTONNA – Kay Plitt – 5621 N. 9th Road – Arlington, VA 22205. Daoud’s book is still available. Email Kay at: kay@fotonna.org or mail in a request to: FOTONNA – c/o Kay Plitt – 5621 N. 9th Road – Arlington, VA 22205. Your request and a $15 donation per book will secure a copy as a gift. Include your name/address/number of copies you want. An email address would be welcomed. We are assuming that everyone who receives our FOTONNA Newsletter is also very aware of what is happening in Gaza and Israel at this time. We have received so many articles written by both Palestinians and Israelis that it is difficult to forward all of them to you; however, we have attached a number of them to our website under the heading “Beyond TON – Must-read Articles” and will continue to add to them as they come to us. If you have not been receiving these directly from other national organizations, we urge you to read them all and send letters of protest of the actions being taken by the Israeli government and IDF to your local media outlets, your political leaders, the U.S. Department of State, and President Obama. We all recognize that you cannot equate the destruction of trees with the lives being lost, but you can equate the overall destruction taking place as prime examples of international laws being broken with impunity by the Israeli government and military. The Tent of Nations might not be a direct target with the situation in Gaza, but the destruction of the trees in May 2014 illustrates just how tenuous their situation actually is and how bold the Israeli government has become in carrying out illegal incursions wherever they want to go. With no strong backlash from governments anywhere in the world, the destruction of lives and trees and homes and whole villages will continue unabated until and unless we act with some sense of urgency and grass-roots power. The first death in this situation should never have taken place. When will we be satisfied that the last one will really be the last one, and who do we ask to volunteer to take that place in our history books? If we do not become part of the solution, we continue to be part of the problem. Stop the Massacre in Gaza! Transportation is being organized from all over the country.